Car seat recalls don’t happen all that often, but when they do, it is imperative that you get the latest information as soon as possible. There are many reasons why a car seat recall may happen, including malfunctioning parts, safety issues, or defects. Sometimes these problems aren’t discovered until a few years after you’ve purchased the seat itself. Of course, this is only the tip of the iceberg. You can also find information about how to fix car seats that have been recalled, as sometimes manufacturer’s won’t need to replace the entire seat, but rather you will need to install a new harness or put a specific item onto your seat. It all depends on the severity of the problem. No matter when or where you purchased your car seat, you have to stay on top of the latest information. We will update our social media with the latest updates about all recalls. Washington-based manufacturer Diono, formerly known as Sunshine Kids Juvenile, has issued a voluntary product recall for 519,052 child seats for not properly protecting children during a crash. 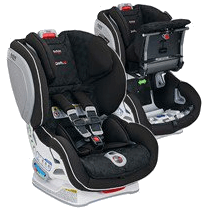 Noncompliance: Diono is recalling certain Radian R100, Radian R120, Radian RXT, Olympia, Pacifica, and Rainier convertible and booster car seats. When the seat is installed in the forward facing position and secured to the car using the lap belt without also using the top tether, the seat may not adequately protect the child from injury in the event of a crash. As such, these child seats fail to conform to the requirements of Federal Motor Vehicle Safety Standard (FMVSS) number 213, “Child Restraint Systems.” Only seats manufactured between November 25, 2013, and September 5, 2017, are affected by this recall campaign. Consequence: If the seat is installed with only the lap belt, the child has an increased risk of a chest injury in the event of a crash. Corrective Action: Diono will notify owners, and provide a free remedy kit with an updated instruction manual, an energy absorbing pad, as well as a new chest clip, free of charge. The recall is expected to begin November 22, 2017. Owners may contact Diono customer service at 1-855-215-4951. In its continued commitment to child passenger safety, Britax determined the center tab on the chest clip – on certain infant car seat models – can break and present a choking hazard to an infant in the car seat. There have been no choking injuries. Britax is announcing this recall out of an abundance of caution. Involves chest clips on certain Britax B-Safe 35, B-Safe 35 Elite and BOB B-Safe 35 infant seats. The broken tab may present a choking hazard to an infant in the car seat, increasing the risk of injury. The following model numbers are affected. Recall Acknowledgement on National Highway Traffic Safety Administration web site. Graco is recalling more than 25,000 car seats certain Graco My Ride 65 convertible child restraints, models 1871689, 1908152, 1813074, 1872691, 1853478, 1877535, 1813015, and 1794334. In the event of a crash, the child seat webbing may not adequately restrain the child. National Highway Traffic Safety Administration (NHTSA) Campaign Number: 17C001000. According to the NHTSA, Graco will contact consumers and provide replacement restraints starting July 17, 2017. Parents can call Graco at 1-800-345-4109 for more information. More recall info on Graco official site. This recall involves Combi Shuttle model stroller/car seat combos, which when used together are called a travel system. The strollers and car seats have model number 6100027 or 6100100 printed on a label on the base of the car seat and stroller’s leg. The car seat and stroller were sold in titanium (silver) and red chili (red) colors. Combi is printed on the front of the stroller and the car seat. Shuttle is printed above the model number. To date, there have been no injuries or incidents reported, according to the U.S. Consumer Product Safety Commission. Those with questions can call 844-332-6730 from 8:30 a.m. to 4:30 p.m. Eastern on Monday through Friday or visit www.combiusa.com. Britax B-Agile and BOB Motion strollers, which include a car seat that can be taken on and off the stroller, have been recalled due to a potential problem with the connection between the two. The recalled strollers were sold from May 1, 2011, to Feb. 15, 2017. It includes folding, single or double occupant strollers. About 36 000 units were sold in Canada, 676 000 in the U.S., and 4 600 in Mexico. Check If Your Britax strollers Is Affected By A Recall. 4moms is recalling certain 4moms Self Installing Rear-facing Infant Car Seats, model number 1032, manufactured July 1, 2016, to October 31, 2016. Due to a tight rivet, the affected car seats have a coupling hook that may not properly engage around the coupling pin, preventing the infant carrier portion from securely attaching to the seat base. 4moms will notify owners and will replace the infant carrier portion, free of charge. The recall began on January 10, 2017. Owners may contact 4moms at 4moms.com/recalls or by calling 1-888-614-6667. Baby Trend, Inc. (Baby Trend) is recalling certain Hybrid LX 3-in-1 Centennial booster seats, model number FB58181, manufactured on July 23, 2016, and Hybrid LX 3-in-1 Kiwi booster seats, model number FB48417, manufactured on July 14, 2016. Certain ClickTight model convertible car seats may contain a defect with the harness adjuster button, which would pose a safety hazard. The harness adjuster button may remain down in the “release” position after the harness is tightened. This will enable the shoulder harnesses to loosen from a child’s movements while secured in the seat. A loose harness may not adequately protect a child in the event of a motor vehicle crash. The recall includes certain Advocate ClickTight, Boulevard ClickTight, and Marathon ClickTight model convertible car seats manufactured between August 1, 2014 – July 29, 2015 with the following US model numbers: E9LT95Q, E9LT95Z, E9LT95N, E1A025Q, E9LT86F, E1A135Q, E9LT86G, E9LT85Q, E9LT86A, E9LT86H, E9LT85S, E1A015Q, E1A016A, E1A016H, E1A166F, E9LT87J, E1A116L, E9LT76P, E9LT71Q, E9LT76N, E9LT76B, E9LT75R, E9LT76L, E1A006B, E1A005R. Recaro is recalling approximately 173,063 car seats. The recall includes certain ProRIDE child restraints (model number 332.01 in all colors) manufactured from 04/09/2010-06/09/2015, as well as Performance RIDE child restraints (model number 333.01 in all colors) manufactured from 01/15/2013-06/09/2015. In the event of a crash, the top tether anchorage may detach from the child restraint.